Imagine a table filled with different jars of candy from Mr. Goodbars to an array of assorted brightly colored candy treats. Who doesn’t love candy? There are several different directions you take that theme. You could do a whole Willy Wonka wedding or just add some small surgary touches here and there. 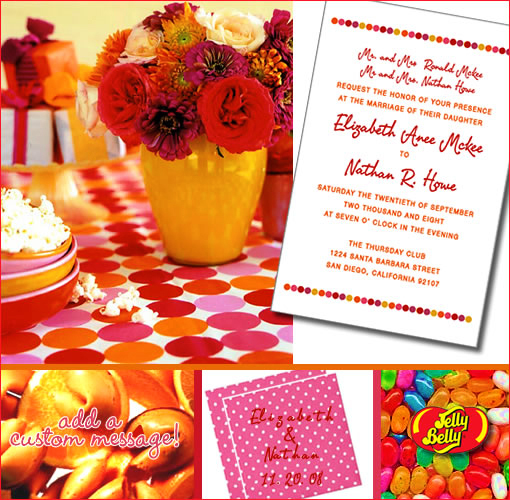 Like some fortune cookies with a custom message or individually wrapped wedding favors from Jelly Belly. We of course love the idea of custom napkins with any wedding. Flowers from Christa W. Ressel and Invites from Joceybella Invites new Joceybella Basics collection, which is coming soon.